No matter where we look, everyday there is news of another hack, another data breach and another headache for security teams to deal with. Is it time to look at the security models we use and ask, if they are not effective today, how are they expected to be suitable going forwards? What models should our businesses adopt? Lee Fisher, Head of Security Business EMEA, at Juniper Networks discusses how security has matured, and proposes a new approach to protect our future. Technology is constantly moving on, and business is constantly moving on with it. Automation is the key to keeping your enterprise on pace, not only with disruptive innovations, but with emerging security threats to your infrastructure, too. Now in the multicloud era, automation is an imperative to drive operational reliability, security and speed without tradeoffs. The edge has been a speculative topic for far too long. Service providers have exclusive "beachfront property" in their networks that can be leveraged to drive revenue through innovative service delivery. While edge cloud deployments must align with constrained capital resources by making the most of existing space, compute, power and bandwidth, they have the untapped potential for generating revenue from differentiated capabilities like multicloud connectivity, IoT, video caching, etc. This webinar will explore the specifics of the edge cloud architecture and production-ready deployment strategies that are an imperative part of service provider business models in the 5G era. As enterprise organizations look to remain competitive in today’s fast paced market, many are developing digital strategies to reduce cost and increase productivity. As a result, connectivity demands are skyrocketing, and networks are becoming more complex. Enterprises are looking to service providers, like you, to simplify their Wide Area Network, and help ease their transition to digital. In this session, we will discuss how you can leverage an SD-WAN solution, to deliver a secure, managed WAN service to your customers, independent analyst house STL Partners will share their insights into today's enterprise WAN market, and discuss how SD-WAN forms part of a platform for delivering a much broader portfolio of managed services. This session introduces innovative, open standard routing technologies that help service providers and large enterprises modernize and simplify their networks by extending cloud principles to their traditional network architectures. The session will explain how highly-efficient fabric technologies, including EVPN, Segment Routing (aka source packet routing or SPRING), and Routing in Fat Trees (RIFT), can be non-disruptively implemented in order to provide the network efficiency, performance, and resource utilization needed to address the demands of the cloud-era. Automation means different things to different people. For industrial vendors, it's about the manufacturing process automation on the production line. IT vendors see automation at a higher level within a company's systems. This webinar will explore how service providers can embark on the automation journey, in particular the reference architecture used to define and to develop autonomous cars: from telemetry components (such as parking sensors) to macro-level autonomous systems (self-driving cars). Enterprises are increasingly challenged to deliver a high-quality user experience for applications and network resources—especially for distributed remote locations with little or no IT expertise, making management difficult. Juniper and Aerohive deliver a simple-to-deploy, easy-to-manage cloud-based wired and wireless enterprise network infrastructure. Aerohive provides simplified cloud management for its high-capacity 802.11ac-based WLAN access points, while Juniper offers high-performance cloud managed campus and branch switching, routing, and security. Join us for this 1 hour webinar where we discuss the challenges of the distributed enterprise environment, and how the Juniper / Aerohive cloud managed solution is helping organizations such as yourselves ease the planning, deployment and management of a wired / wireless campus or branch. Additionally in this webinar, we will preview the cities that we are coming to in the first half of 2019. Juniper and Aerohive will be teaming up to deliver a 3 hour networking event in major cities throughout the United States that will be announced during this webinar. Laurence Pitt, Security Strategy Director at Juniper Networks explains why a key challenge for many security organizations, is the time required to simply maintain a baseline of security. Becoming overwhelmed in activity can prevent security teams from improving existing processes, which creates an ideal environment for cyber criminals who are typically on the offense and have studied the security model's vulnerabilities. Laurence makes the case that organisations need to use their internal data to establish baselines in behaviour, as this information will not be available to attackers. Price, agility, scale, global footprint, and availability of emerging technologies (such as AI, Serverless, IOT, etc) within the cloud platforms have contributed to the rapid adoption of multicloud by businesses across the globe. However, helping business adopt these technologies and deployment models while keeping the network safe from attack is a major challenge for even the most seasoned of security professionals. In this session we will explore how a three-pronged approach using Juniper Networks Unified Cybersecurity Platform can help businesses get multicloud security right. 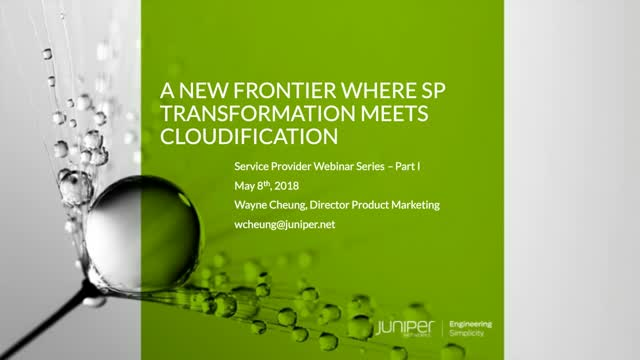 Juniper Networks simplifies the complexities of networking with products, solutions and services in the cloud era to transform the way we connect, work and live. We remove the traditional constraints of networking to enable our customers and partners to deliver automated, scalable, and secure networks that connect the world.